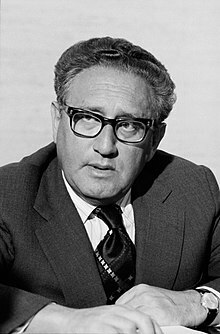 Henry Alfred Kissinger (born Heinz Alfred Kissinger on May 27, 1923) is an American statesman, political scientist, diplomat and geopolitical consultant who served as United States Secretary of State and National Security Advisor under the presidential administrations of Richard Nixon and Gerald Ford. Covert action should not be confused with missionary work. It is a mistake to assume that diplomacy can always settle international disputes if there is "good faith" and "willingness to come to an agreement". For in a revolutionary international order, each power will seem to its opponents to lack precisely these qualities. [...] In the absence of an agreement on what constitutes a reasonable demand, diplomatic conferences are occupied with sterile repetitions of basic positions and accusations of bad faith, or allegations of "unreasonableness" and "subversion". They become elaborate stage plays which attempt to attach as yet uncommitted powers to one of the opposing systems. ... the most fundamental problem of politics, which is not the control of wickedness but the limitation of righteousness. Paraphrased variant: The most fundamental problem of politics is not the control of wickedness but the limitation of righteousness. We fought a military war; our opponents fought a political one. We sought physical attrition; our opponents aimed for our psychological exhaustion. In the process we lost sight of one of the cardinal maxims of guerrilla war: the guerrilla wins if he does not lose. The conventional army loses if it does not win. The North Vietnamese used their armed forces the way a bull-fighter uses his cape — to keep us lunging in areas of marginal political importance. "The Vietnam Negotiations", Foreign Affairs, Vol. 48, No. 2 (January 1969), p. 214; also quoted as "A conventional army loses if it does not win. The guerilla army wins if he does not lose." I don't see why we need to stand by and watch a country go communist due to the irresponsibility of its own people. The issues are much too important for the Chilean voters to be left to decide for themselves. Omi, M.; Winant, H. (2014). Racial Formation in the United States. Taylor & Francis. ISBN 978-1-135-12751-0. Retrieved on 2018-11-02. [Nixon] wants a massive bombing campaign in Cambodia. He doesn't want to hear anything about it. It's an order, to be done. Anything that flies on anything that moves. Intellectuals are cynical and cynics have never built a cathedral. It is barely conceivable that there are people who like war. Lesser known variant: Power is the great aphrodisiac. I've always acted alone. Americans like that immensely. Americans like the cowboy who leads the wagon train by riding ahead alone on his horse, the cowboy who rides all alone into the town, the village, with his horse and nothing else. Maybe even without a pistol, since he doesn't shoot. He acts, that's all, by being in the right place at the right time. In short, a Western. … This amazing, romantic character suits me precisely because to be alone has always been part of my style or, if you like, my technique. Interview with Oriana Fallaci (November 1972), as quoted in "Oriana Fallaci and the Art of the Interview" in Vanity Fair (December 2006); Kissinger, as quoted in "Special Section: Chagrined Cowboy" in TIME magazine (8 October 1979) called this "without doubt the single most disastrous conversation I ever had with any member of the press" and claimed that he had probably been misquoted or quoted out of context, but Fallaci later produced the tapes of the interview. "Wherever a lessening of population pressures through reduced birth rates can increase the prospects for such stability, population policy becomes relevant to resource supplies and to the economic interests of the United States." Before the Freedom of Information Act, I used to say at meetings "The illegal we do immediately. The unconstitutional takes a little longer." … But since the Freedom of Information Act, I'm afraid to say things like that. In the 1950s and 1960s we put several thousand nuclear weapons into Europe. To be sure, we had no precise idea of what to do with them. The emigration of Jews from the Soviet Union is not an objective of American foreign policy. And if they put Jews into gas chambers in the Soviet Union, it is not an American concern. Maybe a humanitarian concern. Statement of 1973, as quoted in "In Tapes, Nixon Rails About Jews and Blacks" in The New York Times (10 December 2010). Ever since the secret trip to China, my own relationship with Nixon had grown complicated. Until then I had been an essentially anonymous White House assistant. But now his associates were unhappy, and not without reason, that some journalists were giving me perhaps excessive credit for the more appealing aspects of our foreign policy while blaming Nixon for the unpopular moves. These tendencies were given impetus by an interview I granted to the Italian journalist Oriana Fallaci, without doubt the single most disastrous conversation I ever had with any member of the press. I saw her briefly on Nov. 2 and 4, 1972, in my office. I did so largely out of vanity. She had interviewed leading personalities all over the world. Fame was sufficiently novel for me to be flattered by the company I would be keeping. I had not bothered to read her writings; her evisceration of other victims was thus unknown to me. The superpowers often behave like two heavily armed blind men feeling their way around a room, each believing himself in mortal peril from the other, whom he assumes to have perfect vision. Each side should know that frequently uncertainty, compromise, and incoherence are the essence of policymaking. Yet each tends to ascribe to the other a consistency, foresight, and coherence that its own experience belies. Of course, over time, even two armed blind men can do enormous damage to each other, not to speak of the room. America has no permanent friends or enemies, only interests. Henry Kissinger: The White House Years, quoted from Dinesh D'Souza: What's so great about America. This echoes Lord Palmerston's words: "We have no eternal allies, and we have no perpetual enemies. Our interests are eternal and perpetual". The End of the Road (1982), Ch. 25 "Years of Upheaval"
If you believe that their real intention is to kill you, it isn't unreasonable to believe that they would lie to you. Observation made privately, quoted by Time journalist Michael Kramer, The Case for Skepticism Time, (26 December 1988), in the context of doubts about PLO sincerity in hinting about recognition of Israel. A country that demands moral perfection in its foreign policy will achieve neither perfection nor security. Empires have no interest in operating within an international system; they aspire to be the international system. Empires have no need for a balance of power. That is how the United States has conducted its foreign policy in the Americas, and China through most of its history in Asia. If Tehran insists on combining the Persian imperial tradition with contemporary Islamic fervor, then a collision with America — and, indeed, with its negotiating partners of the Six — is unavoidable. Iran simply cannot be permitted to fulfill a dream of imperial rule in a region of such importance to the rest of the world. If you mean by "military victory" an Iraqi government that can be established and whose writ runs across the whole country, that gets the civil war under control and sectarian violence under control in a time period that the political processes of the democracies will support, I don't believe that is possible. The issue before us is whether the 21st century belongs to China. And I would say that China will be preoccupied with enormous problems internally, domestically with its immediate environment, and that I have enormous difficulty imagining it will be dominated by China, and indeed, as I will conclude, I believe that the concept that some country will dominate the world, is in itself a misunderstanding of the world in which we now live...In the geopolitical situation, China historically has been surrounded by a group of smaller countries, which themselves were not individually able to threathen China, but which united, could cause a threat to China, and therefore historically, Chinese foreign policy can be described as "barbarian management". So China had never had to deal in a world of countries of approximately equal strength, and so to adjust to such a world, is in itself a profound challenge to China, which now has 14 countries on its borders, some of which are small, but can project their nationality into China, some of which are large, and historically significant, so that any attempt by Chinese to dominate the world, would evoke a counter-reaction that would be disastrous for the peace of the world. Every civilization that has ever existed has ultimately collapsed ... History is a tale of efforts that failed, of aspirations that weren’t realized . . . So, as a historian, one has to live with a sense of the inevitability of tragedy. Here, according to the mythology of the liberals, was a peaceful little country that Nixon attacked. The fact that there were four North Vietnamese divisions within 30 miles of Saigon coming across the border killing Americans—killing 500 a week starting within two weeks of Nixon’s inauguration—was ignored in the debate on Cambodia by protesters emphasizing the technical neutrality of Cambodia and ignoring that its ruler had invited our response. The reason that university politics is so vicious is that the stakes are so small. Somebody once said that one of the reasons academic infighting is so vicious is that the stakes are so small. There's so little at stake and they are so nasty about it. The reason that academic politics is so vicious is that the stakes are so small. Accept everything about yourself — I mean everything, You are you and that is the beginning and the end — no apologies, no regrets. Who do I call if I want to speak to Europe? Speaking in Warsaw in 2012, Kissinger said that he didn't think the saying originated with him, "I am not sure I actually said it, but it's a good statement so why not take credit for it?" Today, America would be outraged if UN troops entered Los Angeles to restore order. Tomorrow they will be grateful! This is especially true if they were told that there was an outside threat from beyond, whether real or promulgated, that threatened our very existence. It is then that all people of the world will plead to deliver them from this evil. The one thing every man fears is the unknown. When presented with this scenario, individual rights will be willingly relinquished for the guarantee of their well-being granted to them by the world government. This is widely reported on many sites as coming from the Bilderberg Conference (1991) Evians, France, purportedly recorded by a Swiss diplomat, but no such recording has ever been provided. Military men are "dumb, stupid animals to be used" as pawns for foreign policy. Kissinger has denied saying it. The only evidence that Kissinger ever said this was a claim in the book, The Final Days, by Bob Woodward and Carl Bernstein, in chapter 14 (p.194 in the 1995 paperback edition). Woodward & Bernstein claimed that one of Kissinger's political foes, Alexander Haig, had told someone unnamed, that he (Haig) had heard Kissinger say it. That's triple hearsay, made even weaker by the fact that one of the parties is anonymous. Kissinger has denied ever saying it, and it was never substantiated by Haig, nor by anyone of known identity who claimed to have heard it. As Kirkus Reviews noted about the whole book, "none of it is substantiated in any assessable way." In fact, the quote is not even very plausible, on its face. 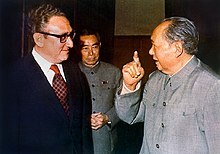 Kissinger served with distinction in the U.S. Army during WWII, and was awarded the Bronze Star. He has always been very respectful of other servicemen and their sacrifices. For him to have said such a thing would have been wildly out of character. In fact, the awkward phrasing doesn't even sound like Kissinger, whose English prose is consistently measured and careful, despite his heavy accent, even when he speaks extemporaneously. Henry Kissinger is possessed of a truly superior intelligence, in addition to which he has two qualities which, unfortunately, many great men lack: he is able to listen and he has a very subtle sense of humour. Pride comes before a fall- although in his case it's more conceit than pride. A good liar must have a good memory. Kissinger is a stupendous liar with a remarkable memory. I think Henry Kissinger grew up with that odd mix of ego and insecurity that comes from being the smartest kid in the class. From really knowing you're more awesomely intelligent than anybody else, but also being the guy who got beaten up for being Jewish. Here we begin to see the outlines of the misconceived lesson that Henry Kissinger appears to have drawn from his study of international relations in the past. Secured by his own bureaucratic devices and habits of mind from having to respond to critics or other branches of government, though he could always get his opinion or policy echoed and supported by a well-placed article or interview or congressman, he indeed related to Richard Nixon much as did Metternich to the Emperor Francis II. An ambitious and intelligent courtier with the ear of an absolute ruler is in a position of unique influence, especially if he carries no responsibility for domestic affairs—this much history does indeed teach us. Moreover, although the courtier runs obvious risks if he incurs the ruler’s wrath, it is the ruler himself who is truly vulnerable in a crisis. The cleverest courtiers—Talleyrand comes to mind—will survive the fall of their masters, with some quick footwork and a recasting of the historical record; and Kissinger was among the cleverest of them all. Back in 1957, Henry Kissinger—then a brilliant, iconoclastic young Harvard scholar, with his eventual career as cynical political manipulator and, later, as crony capitalist still far in the future—published his doctoral dissertation, A World Restored. One wouldn't think that a book about the diplomatic efforts of Metternich and Castlereagh is relevant to U.S. politics in the twenty-first century. But the first three pages of Kissinger's book sent chills down my spine, because they seem all too relevant to current events. [...] It seems clear to me that one should regard America's right-wing movement--which now in effect controls the administration [...] as a revolutionary power in Kissinger's sense. That is, it is a movement whose leaders do not accept the legitimacy of our current political system. Once you’ve been to Cambodia, you’ll never stop wanting to beat Henry Kissinger to death with your bare hands. You will never again be able to open a newspaper and read about that treacherous, prevaricating, murderous scumbag sitting down for a nice chat with Charlie Rose or attending some black-tie affair for a new glossy magazine without choking. Witness what Henry did in Cambodia – the fruits of his genius for statesmanship – and you will never understand why he’s not sitting in the dock at The Hague next to Milošević. While Henry continues to nibble nori rolls & remaki at A-list parties, Cambodia, the neutral nation he secretly and illegally bombed, invaded, undermined, and then threw to the dogs, is still trying to raise itself up on its one remaining leg. FBI: FBI terrorism tip line. Huey: It’s Huey again. Got another hot lead on a terrorist. FBI: Lord…Huey, we don’t have time for this. I’m hanging up. Huey: Wait! I got a good one this time! Huey: Kissinger, Henry, Former secretary of state under Nixon, allegedly responsible for the deaths of about 950,000 civilians in Laos and Cambodia in the early 1970s. if you’re having trouble finding him, ask the guys who gave him the Nobel peace prize. Aaron McGruder, The Boondocks, (1/22/2002). 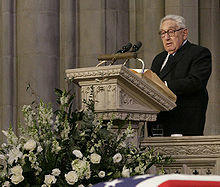 NPR: Kissinger Speech at National Press Club. Towards the end [55:55], he responds to Hitchens. Linkage and Arms Control. Interview conducted on November 26, 1986 for the War and Peace in the Nuclear Age series. This page was last edited on 15 April 2019, at 21:35.